Road trips c̶a̶n̶ should be delicious! We’ve gathered some breakfast recipes that work perfectly while on the road. 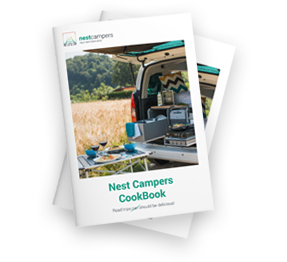 Here you'll find the easiest recipes you can make on a campingstove or campfire while living out of a campervan. Eggs and bananas, and that's it. These two ingredients, whisked together and given a little skillet love, are truly something magical! Just use the ratio of 2 eggs : 1.5 bananas. For example, for four people, you’d use 8 eggs and 6 bananas. Mix banana and eggs together in a bowl until smooth. Add ground flaxseed and vanilla extract if you have some and mix batter well. Heat oil in a small skillet over medium-low heat. Scoop batter, about 1/4 cup per pancake, onto the skillet and cook until the center starts to bubble, about 30 seconds. Flip pancakes and cook until bottoms are lightly browned, 1 to 2 minutes more. These pancakes are awesome on their own, but you can add some great things: chopped nuts, chocolate chips, fresh blueberries, or even a handful of leftover granola. Sprinkle these extras over the pancakes on the griddle as the first side cooks. And of course, when you pile these on your plate, don't forget to add whichever topping you like. Muesli with fresh fruit, nuts and Greek yoghurt will give you all the energy you need for a morning of adventures! Nuts, almonds, pecans and hazelnuts - use Odlično mix if you still have some left! Simply mix yoghurt, fruit, honey and other goodies into the consistency that suits your tastes, leaving out anything you don’t like and adding anything extra that you do. Nothing says "vacation mode on" like some pancakes for breakfast. With a lot of different toppings off course! Add wet ingredients to a bowl and whisk to combine thoroughly. Ideally, you should add the whisked ingredients to the dry ingredients, which means another bowl. But if you add dry ingredients slowly to the wet, we think you and your pancakes will survive. When your frypan/hotplate is sizzling (and greased, because you don't want pancakes sticking), pour in enough batter to create a pancake of the size you like, and wait until bubbles appear on the top. When you see the bubbles appearing all around the outside, it's time to flip and wait another 1-2 minutes for it to cook. And now it’s time to go crazy with the toppings! Chocolate, fresh berries, Nutella, honey, fruit jams and marmalades, fresh fruit, nuts, coconut, maple syrup, fresh cream … You name it. You can also make a savoury version, just skip all the sugar and melt some cheese on your pancakes, add bacon or ham, mushrooms, tomatoes, … whatever you like. Enjoy! The most delicious way to use up an old bread. Whisk the above ingredients in a bowl and dip a slice of bread until soaked right through. Fry until golden brown on both sides and serve with whichever delicious toppings you have in your Nest campervan! Have fun with your standard egg omelet! Melt some butter in a pan over medium heat. Cook the onion and pepper, stirring occasionally until vegetables are just tender. While the vegetables are cooking beat the eggs with the milk, 1/4 teaspoon salt and pepper, set aside. Remove the vegetables from heat, transfer them to a clean bowl and sprinkle the remaining 1/4 teaspoon salt over them. Melt the remaining butter (in the frying pan just used to cook the vegetables) over medium heat. Add the egg mixture and cook the egg for 2 minutes or until the eggs begin to set on the bottom of the pan. Gently lift the edges of the omelette with an egg slice to let the uncooked part of the eggs flow toward the edges and cook. Continue cooking for 2 to 3 minutes or until the centre of the omelette starts to look dry. Sprinkle the cheese over the omelette and spoon the vegetable mixture into the centre of the omelette. Using an egg slice gently fold one edge of the omelette over the vegetables. Let the omelette cook for another two minutes or until the cheese melts to your desired consistency. Slide the omelette out of the frying pan and onto a plate. Cut in half and serve. Shakshuka — a dream dish of eggs baked in a zesty tomato sauce. Heat oil in a medium frying pan over medium heat. When it shimmers, add onion and cook until just softened, about 2 to 3 minutes. Stir in tomato paste, harissa, and garlic, and cook until fragrant, about 30 seconds. Add peppers and stir to coat. Add tomatoes and salt and bring to a simmer. Reduce heat to low and cook, stirring occasionally, until thickened, about 30 minutes. Take the back of a spoon and make a few dents in the sauce (however many eggs is however many dents). In the indentations, crack the eggs and wait till the eggs solidify. Decorate with rosemary sprig and/or chopped parsley, sprinkle with feta cheese and serve with bread! Poaching is a simple way to transform the humble egg into a luxurious treat. And camping is the perfect time for luxurious treats! Pile the avocado and feta on the toast, then put a poached egg on top of each, sprinkle with more chilli if you like. Enjoy! Porridge can be an extremely flavoursome dish as long as you add some tasty extras.